All Saints’ Tennis Club is a family friendly club associated with All Saints’ Anglican Parish. Our members enjoy social tennis, competitive tennis and tennis lessons. Our Tennis Club has been part of Newtown and the surrounding community since 1907. 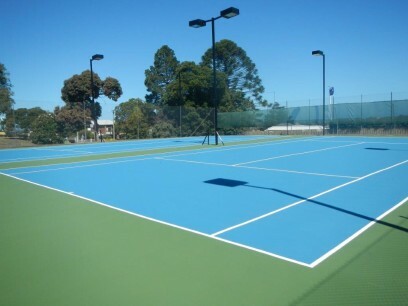 We are located at 113 Noble Street at the rear of the All Saints’ Parish Hall, where we have 2 plexipave tennis courts, with lights and exclusive use of Kenwith Park and Geelong West for Juniors, if required. The current membership is around 100 and we are one of only two tennis clubs in the Newtown and Geelong West areas to cater for juniors all year round. Our Tennis Club is family and community orientated and encompasses a broad range of activities including tennis sessions with the church playgroup and regular Vietnam Veterans social tennis. We hold a number of social events throughout the year including an annual art show and trivia night. We are affiliated with Tennis Victoria and Tennis Geelong and field between 3 and 10 teams in their Saturday Junior and Senior Competition. We also have a team in the ladies mid-week competition.